We specialize in offering high quality Frozen Pork Bellies, which are hygienically processed and packaged at our vendors’ end. Our Frozen Pork Bellies are healthy and have natural taste due to the absence of preservatives and colorants. Available at market leading prices, our Frozen Pork Bellies can be obtained from us in customized packaging options. 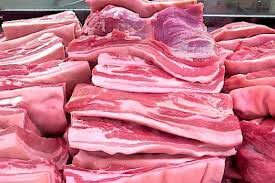 The name of our company surfaces prominently among the trusted Exporters and Suppliers of Frozen Pork Bellies from Thailand.